Last Fall (no pun intended) we had a dear elderly woman of the church suffer a stroke and fall in the foyer before the service. She went to be with the Lord by the end of the week. I would not rank this amongst my fondest memories of a Sunday morning, but it is a memory that I believe will stick with me for the rest of my life. Not because of the trauma of the event or even the sadness of how she fell but more so because of how I saw others in the church respond. Within seconds of her having hit the floor there was a group of people helping her out in various ways. Some assessed her condition, another got a pillow for her head, another got the first aid kit, another made an ice pack, another called her son to let her know she had fallen while I dialed 911. Another small group pulled the children aside and kept them busy with activities so they did not have to see what was going on. And while all of this was happening all around her throughout the foyer an unknown but large number of people prayed for her. Amongst this group who helped out each in their own way there were represented many different occupations and individuals with skills of all kinds who provided loving care including medical professionals and others trained in emergency services. When all was said and done I decided that if there was a good place to fall or have an accident it would be in church. For it is there we can receive help and support both physically and spiritually and this thought is what leads this pulpits wanderings this week. I shudder when I think of what might have happened if this dear lady had fallen like this alone in her home. I wonder how long it would have been before someone found her and also if by then it would have been too late to offer any real help anyway. Unfortunately, falling is part of life for everyone, not just physically but also spiritually. We all have had times where we struggle spiritually sometimes due to poor decisions, sometimes because of the decisions and actions of another, and sometimes just because we grow tired and weary of our sinful nature and sinful world. However, the church has been organized by the Lord to be a family to help us in our struggles and to do life with in general. However, when one is not a part of a local body of believers they leave themselves in danger of spiritual shipwreck which can, and often does, have long lasting and far reaching side effects which impact the lives of far more than just ourselves. 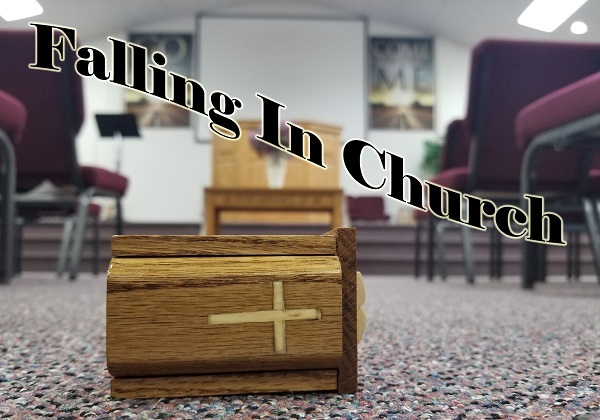 Take a moment to consider several reasons why it is good for us to be in church when we fall as opposed to anywhere else. As I already cited in my opening story about a literal fall in the church so we can notice the same in a spiritual sense. When we are plugged into a local body of believers we place around ourselves a support structure which is available at a moment’s notice to offer aid as well as to rejoice and weep with us as we go through life (Romans 12:15). When one is not a part of a local church many of those emergency spiritual needs go unfulfilled and when not treated can lead to lasting scares. I hear many people today complain about how hard it is to find a doctor who actually knows and cares about you and the same can often be said about churches as well. The church was never created to function as a place of entertainment or a building to gather at once a week. The church is the body of Christ, a family of believers who together seek to see the Lord’s will done in their lives as well as in their communities. When one is plugged into a Biblical church there is also a system of support that is personal and comes not just from a pastor or the church leadership but every other believer each having their own unique testimony of God’s faithfulness about everything under the sun. In this we can be personally and specifically ministered too in each of our needs and struggles. The world is very well equipped to deal with physical problems but the spiritually lost and dead are unable to provide the aid we need for our souls. The Lord alone is able to meet our spiritual needs and one of the primary ways He has chosen to do this is through His church. When we look to the world for aid in regards to our hearts we will only find band-aid solutions. In order to receive this grace of God we must be present and connected within the church. Often after a major accident or surgery one must go through a time of physical therapy. So is often the case when we suffer spiritually. We may get over the trauma but we need continual exercise and support in order to get back to where we need and desire to be. The church is perfectly equipped to help in this area as well with regular meetings and gatherings of all kinds. The church is able to continually build us up and encourage us to keep our focus so that we are able to remain where we should be spiritually. When all is said and done, what I propose is this: if we are going to spiritually fall (that is, fall into sin, depression, hopelessness or discouragement), and let’s be honest we all will, we are far better off to do so in the church. For there is really no better place for us to fall than where the body of Christ can lift us up to the Great Physician. There we can receive the aid we truly need in the moment as well as into the future. When individuals cut themselves off from the church it is like a sheep making itself vulnerable by separating itself from the flock. This unfortunately never ends up well for sheep. When I speak of this separation from the church I don’t mean just in regards to church attendance (though that is the first step) but also in regards to really becoming a part of the church. That means more than just warming a pew for an hour or two on Sunday but rather choosing to invest in fellow believers and the work of the Lord in and through that local church. This means being honest with fellow believers and taking off the masks we so often put on when we step through the doors of a church building. At the moment of salvation, we become a part of the family of God but unfortunately many Christians go throughout life without actually living with the family. This is a great tragedy and is one of the primary reasons why the church often appears ineffective in our culture today. Yes, much of it has to do with church organizations and leadership but just as much of it has to do with how Christians choose to approach and plug into the church. The church ought to be the safest and best place for any person to fall spiritually but when one is absent from the church or acting while in the church, they fall in a place without speedy, specific, spiritual or steady aid as God would have them to receive. So let us ask ourselves, are we in a good place to fall? A good way we can answer this question is by considering the commandment of Romans 12:15, “Rejoice with those who rejoice, and weep with those who weep.” Take a moment to reflect upon this verse and ask how you are doing this now within your local church.